Where can I park for court and county-related business? Due to the Court Facility Improvement Project demoliton and construction, there will be limited public parking. We have provided a map that will give you information on where to park, costs, and walking distances. Parking Meters - The parking meter rate is 25 cents per hour. The meters only accept quarters. Silver meters have a 2 hour time limit and the green meters have a 12 hour limit. All meters are in effect Monday through Friday from 8AM to 5PM and are free on weekends and evenings. 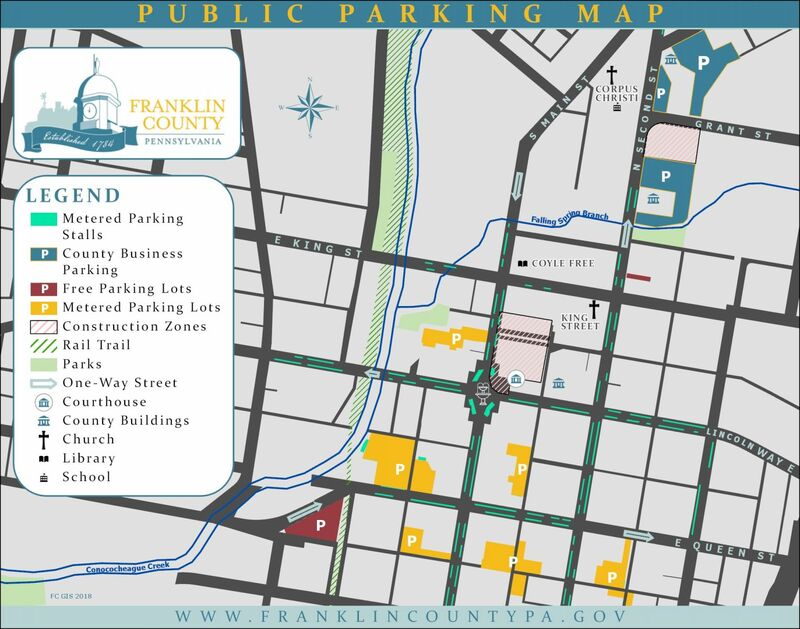 Walking Distance to the Courthouse - Parking lots located furthest from the Frankliln County Courthouse are estimated at an 8 - 10 minute walk. The above map can be found here as a pdf. Why does the courthouse have to be built in Chambersburg? State statute 42 Pa.C.S.A. subsection 3721 states that a county judicial center or courthouse “shall be maintained at the county seat of each county.” This means that, per state law, the courthouse must remain in the Borough of Chambersburg as it is the county seat of Franklin County. I hear that the movement of inmates is currently problematic. Is this correct? Yes, courthouse security is problematic, especially regarding prisoner movement and public congestion. Often times inmates, jurors, judges and staff must travel the same hallways which requires additional security and coordination. Continuing to provide proper security for the facility and those within will end up costing the County a significant amount of money due to operational logistics. The design of the proposed new facility will maintain three levels of security: the public, court and county personnel, and incarcerated individuals. These secure “circulation paths” will greatly improve security while also reducing costs. Is the current court facility ADA accessible for those with physical disabilities? Many areas are not accessible. Jury boxes, witness stands, Courtroom #1, trials on the second floor, jury deliberation rooms on the third and fourth floors are some areas that are not accessible to those with physical limitations. The proposed new facility and remodeled offices will be in compliance with current ADA standards allowing for accessibility for all persons with physical limitations. Does the Courthouse and Courthouse Annex have the infrastructure to accommodate modern technology? The current courthouse and courthouse annex were remodeled and built for the technology needs at the time of the construction, which does not accommodate the technology needs of today. A new facility design will take into account current technology needs as well as plan for future advancements in technology, saving money and time. Will the new courthouse improve the jury experience? We have focused a lot on how the safety and security of Franklin County residents is of utmost concern, but haven’t talked much about how the proposed new court facility project would improve the jury experience. The proposed facility plans for additional spaces for jury selection as well as secured, fenced-in parking for jurors. The Main Entrance has an overhang/ porch area to protect the public from the weather when waiting to enter the building. There is a large lobby allowing those going through security to be inside. Past security you will find areas to assemble jurors for the selection procedure, adequately sized jury deliberation rooms with private restrooms, and most importantly is the feature that makes a courthouse more than just a building—secure circulation paths which keep jurors separated from the public and from defendants. I live in Franklin County. How much will this proposed project cost me? The estimated cost of this proposed project for a Franklin County resident owning a $150,000* property is $29.48 per year. What is the projected start and finish date? The Franklin County court facility improvement project will take approximately three years to complete. One year to design and bid, and two years for construction. The county will look at phasing the project. If advantageous, the Administration Annex improvement project, which will take approximately 18 months to two years to complete, will move forward while the courthouse project is being designed and bid. What about the new courthouse design? Silling Architects, specializing in courthouse architecture, say that a courthouse should represent the decade in which it is built—not designed to imitate adjacent historic architecture, but to enhance it. The new structure will be set back from the Old Courthouse building, increasing the plaza space and better highlighting the Old Courthouse as a focal point of the downtown square. Building components will be chosen based on the durability, longevity, and ease of maintenance which allows for the most efficient building life-cycle and responsible use of taxpayer dollars.